It's done with radio telescopes FFS. And it's 55 million light years away so what the hell did you expect? Oh boy our scienctists behave like gods that know everything but can't even take proper pics yet. These pics not proper enough for you? Oh dear. You don't have a clue, do you? For a start, this is not even NASA. Please enlighten or is it the camera story from the 70s. ...That is, If I used those exposure settings on Earth, or exposure settings for taking a picture on a sunny day, and tried to take a picture of stars in the night sky -- even on the starriest of nights -- I would not expect to see the stars showing up in the picture, even if they were visible to my eyes. But back to the point of the thread. The Event Horizon Telescope (EHT) does not use visible light; it uses radio to take images. And the EHT is not even one telescope. It is a network of many radio telescopes spread all over the world. By using these telescopes together in a certain way, they can act as one very large telescope. The radio background against which this black hole sits is extremely bright, so they had to only use the data coming from their target to create the image. 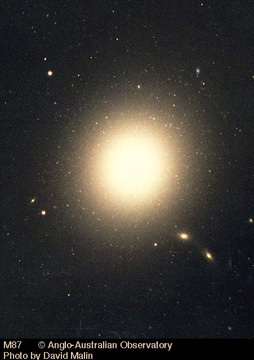 The black hole is at the center of galaxy M87, which is pictured below. That bright blob in the image below is not a star, but an entire galaxy of billions of stars. The black hole is just a tiny speck in the center of that galaxy, which is 55 million lightyears away. The global array of telescopes gathered may petabytes of data that needed to be analyzed, sorted through to find the relevant black hole data, and put together in the form of a single image. This was done through a complex algorithm and a process called very long baseline interferometry (the "very long baseline" being the distance between the various telescopes used). The decoding of the data to get this image took almost two years. There will be a special on the Smithsonian Channel tomorrow night (Friday, April 12) at 9 PM Eastern Time about this image. I think it will be discussing this image from the collection of the data to the decoding of the data into that final black hole image. So maybe it will answer some of your questions. Do you think, if we had the ability to travel at warp speed, we could travel through it? It will probably just blow out all the plasma conduits. FREE photo of black HOLE!!! to add so you under stand. If light can NOT leave a Black hole. they are fooling you and them self's. And I DONT believe in flat earth! thats just a tool they use to discredit any one who speaks out against them! The light is not from the black hole itself, but from the accretion disk around the black hole -- i.e., the stuff in orbit around the black hole, but farther away that the black hole's event horizon so the light and other EM radiation from the orbiting stuff can still escape. The dark spot inside the ring of the lit accretion disk is the silhouette of the event horizon of the black hole. No light can escape past the line of the event horizon, so it is seen as a dark silhouette against the accretion disk. Just have Q create a strong enough static warp shell to protect the ship and the traveler to provide the needed speed to get through it.